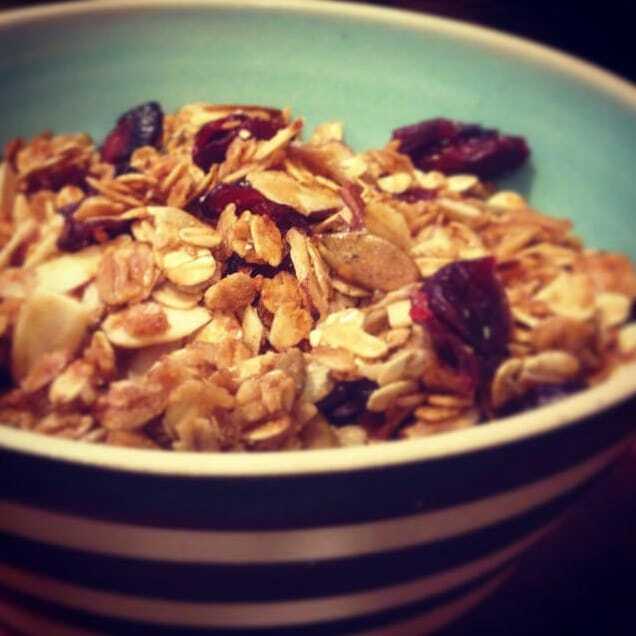 I recently discovered how amazingly good granola is. I can’t believe it’s taken me this long. All those wasted years of not eating granola- kills me just thinking about it. My husband on the other hand pretty much eats granola every day and has for years. He would say, you know, you should try this. And I would just wrinkle my nose at him. It just seemed unappetizing to me for some unknown reason. Last Christmas my sister-in-law, who is one of those people gifted with the gift of giving, sent us a ball jar filled with homemade granola with a nifty fabric on the top. It was such a beautiful gift, both her time and the thought that she put into it, that I felt obligated to try it….and it was delicious! I was hooked from then on and I needed to figure out how to make our own. I tried many different recipes, adding a bit of this and that and I finally got it to the point of exactly how we like it. This recipe is a combination of a recipe a high school friend gave me and a recipe I found on Pinterest (of course) and adding what we like. This makes a big batch because we kept running out of granola way too soon for our liking. 1. Preheat oven 250 degrees. 3. Small saucepan over medium heat: Combine brown sugar, honey and oil. Cook until well mixed- just a few minutes. Then pour it over oat mixture. 4. Add cinnamon and salt. Stir until oats are evenly coated. 5. Divide the granola among 2 cookie sheets (sprayed with pam or on a silpat if you have one) and spread granola mixture evenly and press down. 6. Bake for 1 hour, stirring every 15 minutes. 7. Remove from oven and allow to cool completely. Break apart and place in a large bowl. Add dried cranberries. Combine well. I love to eat this for breakfast with milk and chopped honeycrisp apples. My husband adds it to his yogurt. My son likes to snack on it after school. My daughter……well, she’s the picky one and still refuses to try it. One day. The bowl that my granola sits in so prettily is a bowl I purchased from San Franciscan artist Eileen Goldenberg. Black and white stripes on the outside and turquoise inside- makes me happy every time I use it. It’s the little things in life.